Today we went to Manzanar, which is is one of the ten camps in which 110,000 Japanese and Japanese-Americans were incarcerated without due process after Pearl Harbor. Of the total interned, about 2/3 were American born citizens. It is a shameful part of our past. I am extremely impressed by the efforts of the National Park Service in acquiring the site and excavating a piece of history before it was gone forever. This is the guard gate at the entrance to the facility. Note the beautiful stone work, done by an incarcerated stone mason, Ryozo Kado. The town hall/community center for the camp. It was built by the internees in five months. After the camp was closed it served many other purposes before being returned and refurbished. It now houses the exhibits for Manzanar. This is a scale model of the camp. It was a square mile of barracks, mess halls, latrines, and etc. During the war Manzanar was the biggest city between Los Angeles and Reno with 11,000 people incarcerated. The displays talk about why this happened. The fundamental causes were war hysteria, racism and hatred of the other. Many Japanese immigrants had worked hard and done well, and it bred resentment. After Pearl Harbor the newspapers started calling for the removal of all people of Japanese ancestry due to the possibility that they would mount a Fifth Column action and help Japan's war effort. On Terminal Island in LA, 3,500 families lived and worked, making a living by fishing. They owned their boats. After Pearl Harbor, all the men were rounded up and arrested. Their families were given 48 hours to pack up and go, and then their neighborhoods were destroyed. They were sent to Manzanar. Bainbridge Island had a large population of Japanese as well. Many of them were strawberry farmers. They were first sent to Manzanar, and then to Minidoka in 1943. This is a harsh climate. It's hotter than hot in the summer, and it's cold in the winter. The barracks are made of tar paper stapled to a frame. There were 4 apartments to a 20 by 100 foot structure, 8 people to an apartment. There was no running water in the barracks. When the wind blew, dust would cover everything by blowing in through knot holes in the wood floors, and through the walls. The dust came from Owens Lake which had gone dry. The "fine white dust" often described by internees is consistent with descriptions of dust from Owens Lake. Owens Lake dust is significantly different from regular dust due to its white color and fine consistency. It is often mistakenly referred to as a "mist" or "fog." Scientists have described this dust as a "pervasive, unusually-fine-grained, alkaline dust that infiltrates the smallest cracks and contaminates residences." After the first year, celloboard and linoleum were provided so that there was less penetration of dust into the living quarters. This was posted in the ladies room. It touches on the daily indignities of life living in a camp. In the 1920's, Los Angeles had purchased almost all of the water rights in Owens Valley and diverted it. The area was dying before the camp came. During Manzanar's time, LA had to give back water to run the camps. Streams off the mountains were diverted into reservoirs for camp use. The Japanese spent much time planting and creating these ponds. This is a family pond, almost every barracks had a pond and a garden. They planted grass to hold the dirt, fruit trees and flowers. Over time the internees grew livestock, planted crops, made their own soy sauce, miso and tofu, and operated a few forbidden stills for sake. The Pleasure Park was a large community pond with a pagoda. Cattails grew along the edge of the water, there were trees, it was quite beautiful, and provided a place of respite. The sun was harsh when I took this, but it was very elaborate. They placed rocks to make little rapids with the moving water. This is the former location of Block 3, where the Bainbridge Islanders lived. During internment, 150 Japanese died. Most were cremated, but 15 were buried here. Five are left, the other ten were relocated by their families. At the end of the war, the internees were told they had to leave. Many had no where to go, particularly the people from Terminal Island. Their boats and their homes were gone. Several elderly bachelors killed themselves rather than go. Each person was given $25 and a bus ticket. The buildings were taken down and the wood was sold for building materials. Then the entire area was bulldozed. The Park Service has carefully excavated and mapped and re-created so that there is a monument to this. I knew some of this history because Jim lived on Bainbridge during high school. However, I did not know these following tidbits. After Pearl Harbor was attacked, martial law was declared. All civil liberties, such as freedom of the press were suspended. Twelve hour work days became mandatory. The military took over the islands completely. In spite of these restrictions, the majority of Hawaii's 158,000 Japanese-Americans experienced greater freedom and less prejudice than those on the mainland. Comprising 1/3 of Hawaii's population, their labor was essential for the war effort. However, Japanese-Americans were excluded from occupations such as fishing, teaching, defense work and photography, and were removed from homes and businesses near harbors and railroad terminals. They were also discouraged from practicing Buddhism and speaking Japanese. "We must remember that this is America and we must do things the American way," stated Delos Emmons, Hawaii's military governor. Canada. Seven days after the US announced its decision to relocate all people of Japanese ancestry from the west coast, Canada passed a law which authorized relocation of "every person of the Japanese race." 20,881 people were removed from the west coast of BC, leaving their farms, businesses and homes to be sold by the government to pay for their confinement. Over half were sent to Interior Housing centers at abandoned mining towns and newly built sites in the BC interi0r. Thousands of men were separated from their families and sent to road construction camps. The remainder went to work in the sugar beet fields of Manitoba and Ontario, or settled in self supporting communities throughout the country. Japanese-Canadians were not allowed to return to the "protected zone" of BC until 1949. Latin America. Under pressure from the US, 16 Latin American countries interned 8,500 residents of German, Italian and Japanese descent. Over 3,000 others were deported to the US where they were to be exchanged for US prisoners of war. The deportees' passports were confiscated, and upon arrival in the US were declared illegal immigrants and placed in Department of Justice camps in Texas. The majority of the deportees of Japanese ancestry were eventually sent to Japan either as part of the exchange programs or as repatriates after the war. Of the 2,264 Japanese nationals who were deported from Latin American, 80% were from Peru When the war ended, Peru refused many of those remaining in the US reentry, and the US denied their residency requests. In 1952 364 Japanese-Peruvians were declared "permanent legally admitted immigrants" and became eligible for American citizenship. For the past 44 years there has been an annual pilgrimage to Manzanar. Internees and their children want this to be remembered. It was held last weekend. Wikipedia has a very good article on Owens Valley, the camp, the subsequent investigations as to how the internments happened and the lawsuits which finally resulted in an apology from the president and reparations. It you're in the area, take the time to go. Yesterday's drive from Needles to Lone Pine was only 280 or so miles, but it just took forever. There's a lot of climbing on 395 and the drive seemed like it took a day and a half. Note to self, get up earlier if we do this route again. This is what you see on 395. I was becoming very apprehensive about the RV Park because I knew it was right on 395, and there's nothing out there. All was well, it's a nice park, it's not as grim nearer to Lone Pine and I think it will be an OK two weeks here. We went to the visitor's center to ask about the famous Mobius Arch formation and the Bristlecone Pines. While we were there the nice park ranger told us to go to the Whitney Portal. Lone Pine is very close to Mt. Whitney, which is the tallest peak in the continental US. One can drive up to the Whitney Trail trai lhead, and then walk 10.5 miles to the summit. This is what we saw on the road up to the Portal. A Jay we saw in the parking lot. We walked a little bit up the Whitney Trail. The base of the trail is at 8,400 feet, and we can absolutely tell that we're at that elevation. There is a 2.5 mile trail to a lake we'd like to do, but I'm not sure if I'm going to be up to it. There's another 2,000 feet of elevation gain getting to the lake. Look at the scenery - is it not spectacular? This is going back down the big hill. It's good to have tow haul on the truck, it saves the brakes. After the trip up to the Whitney Portal, we drove out to the Alabama Hills. Almost every western produced between 1920 and 1950 was filmed out there. Recently, parts of Django Unchained were filmed there. This is the famous arch. We were somewhat underwhelmed. Fortunately we didn't have to walk very far to see it. I think after Utah, one is spoiled for all other arches. It's hot here, they're having an unseasonably warm spring. The people who fish are really happy because the high mountain lakes are no longer frozen. I personally would not mind it if it were 15 degrees cooler, but what can you do? I'm still tired, it seems like it should be over by now but it's not. I'm beginning to suspect that "3 month recovery period" means a person is going to feel like crap for three months. Hopefully not, we're trying to be patient but it is extremely tedious. This is what you see on I10 after leaving Phoenix. It's gruesome out there. Lot's of trackless wastes. The agricultural station in California. It was not staffed today. So we were able to smuggle in all of our citrus. We headed north on US95. It's gruesome out there, as well. View out the back of the RV park. More trackless wastes. We're at the Desert View RV Park in Needles. It's a nice park, except for it's out in the middle of nowhere. The sites are very level. The park hosts could not be any nicer if they tried, very helpful and friendly. The free wifi is terrible, but it usually is. We are on site 35 which was long enough to leave the pickup attached to the RV so we're happy about that. The satellite has a clear shot at the southern sky, so life is good. Tomorrow it's on to Lone Pine. Update to post. Getting out of the park this morning was just a bear. The right front tire ended up climbing up on the cement slab patio, the steering wheel turned a bunch to the right, and we ended up dragging the right front wheel down the patio. Once the wheel got off the concrete, it straightened up and that was ok. Then we had to make a left to get out of the park which was a pain due a tight turn, a bunch of fences and posts everywhere. I think if we were to go back to that park, we'd take the truck off the RV before proceeding. It would just be easier all the way around. Yesterday's outing included a stop at a New Balance Store just for something to do. While looking at shoes, we were eavesdropping on the cashier and two other customers. The cashier mentioned she had just gotten her concealed carry permit. The two elderly customers congratulated her and then launched into this heated diatribe about how they couldn't get any bullets! Every morning people line up in front of Cabela's before they open to buy bullets. They sell out of bullets almost immediately. Do you find this odd? I'm not opposed to responsible gun ownership, but we were just open mouthed at the outrage and the general level of being pissed off by these two people because they couldn't buy any damn bullets. Then, we went over to Trader Joe's for frozen mac and cheese, and walked by a barely ambulatory old gentleman wearing suspenders and a gun. I have to tell you, I do not understand the fascination of Arizona's citizens with guns. So today we went over to Cabela's for something to do. It's exactly like Bass Pro Shop except for the name on the building. It's huge, it's difficult to see how they generate enough revenue to cover that much inventory and floor space. Kayaks on the front of the store. Tomorrow we're heading out in to the great wide open. We'll have a short day going to Needles, then Saturday we will arrive in Lone Pine. We're there for a couple of weeks. I checked on grocery stores in Lone Pine today, they have one. We did a big grocery shopping today and cooked ahead some. Today is one week from the ablation. I'm still tired. When I get up and walk the length of the RV, my heart rate is faster than it normally is. Not fast like an arrhythmia, just faster than before. I'm glad we opted not to travel any sooner, it would have been tough. Hopefully the Verizon signal will be good and I can continue to blog. Yesterday we decided to go look at the Encanto-Palmcroft Historic neighborhood in downtown Phoenix. The neighborhood began its life as a planned community in the 1920s. It's situated near Encanto Park, which is one of the largest parks in the city. This would be Palm Lane, which leads you into the historic area. Once in the interior, the temperature drops 10 degrees and it becomes quiet. It's remarkable. Prior to her death, Jim's aunt Win lived in this house. Jim remembers it as a very cool house on the inside as well. Note the deep overhangs to keep the sun off the house. The house wraps around a pool in the back yard. This is the garage in the back. Note the fence on top of the garage. It was possible to jump off the garage into the pool, which Jim did when he visited in the late '80s. We spent some time walking around the neighborhood gawking at the houses. More sun-deflecting overhangs on the porch. I really like the architectural detail of the horizontal rows of brick on the right. This one is on the Register of Historical Places. As cool as this neighborhood is, it's surrounded by this. Downtown has moved in and surrounded the park and neighborhoods with business and hospitals. There is light rail running up and down Central, which is the main drag through the downtown core. I have to say, the Phoenix Metro area is one of the most visually unappealing places we have been. While McDowell Mountain Regional Park is some of the prettiest desert we've seen, once you move west and north, it just goes down hill from there. We haven't been out towards the Superstitions yet, I read that it's lovely there. But we are currently in a very un-lovely part of the world. We have one more day in Phoenix to endure. For awhile we thought we'd pull up stakes Tuesday and head north to Prescott, but Dr. Su was not really enthusiastic about that plan, so we're staying put within shouting distance of the hospital, and resting up. Today is the Monday after last Thursday's ablation. Things are getting better. My heart no longer hurts, and the various weird aches and discomforts have subsided. Today has been a little odd, I'm having a lot of weird sweating of all things. My hands and feet are cold, but I'm sweaty. Who knows, it's always something. We had a follow-up appointment with Dr. Su this afternoon. My EKG looked good, although my EKG always looks good in the doctor's office. EKGs need to be performed on mountain bike trails for maximum data generation. It was an interesting appointment, we learned much. He completed the pulmonary vein isolation portion of the procedure in an hour. Then he went looking for other bad places in the heart. He found more cells firing in the roof of the left atrium. After ablating those cells, he found more bad cells in the left atrial appendage. When Dr. Su originally looked at my holter monitor results he pointed out some really fast beats and called them ectopic atrial tachychardia. I'm assuming that's what those two groups of cells were. Total procedure time was three hours. This picture shows the LAA with an umbrella device in it. During atrial fibrillation, clots form in the LAA, and after awhile they spill over into the blood stream and cause strokes. The goal of the umbrella is to keep the clots from exiting the LAA. It's a new device and is not yet universally accepted as a good thing. My purpose in showing the picture is so you can see what the LAA looks like. This article discusses the difficulty of using RF ablation (heat) on the LAA. 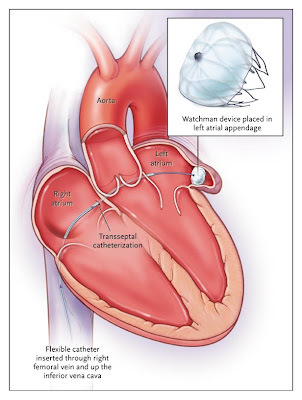 This is my favorite sentence, ".... a high risk to generate steam pops and to perforate the atrial wall has been reported during RF delivery, especially in the LAA." Steam pops! So I was pretty happy to be in the hands someone skilled in the use of cryoablation who could deal with my bad LAA. He's cautiously optimistic about long term success, but there are never any guarantees. For the next three months I am restricted to not exceeding 130 bpm on the bike. That's going to affect what I can ride in Bend. There will be wearing of heart rate monitors and probably more walking than I would normally do. Three months is the estimated time for healing. In other news, we continue to have blooming cactus beauty, and I will leave you with this image. This is not a terrible park. It's on the Black Canyon Freeway in North Phoenix. Although it's close to the freeway, there's not a lot of noise. It's an old park but it's well kept. It looks to be about one third permanent residents. We are on D16, which is level and wide enough to park next to the RV. The internet is really good for the most part. We stayed here to be close to the hospital. There is all the retail a person could ever want in the immediate vicinity. This is a new park model. Note the presence of two porches. It's not a bad size. This is an old park model. Note the two window air conditioners. It's named Honey. Another older park model. See the bump out on the right? We would really like to know what's in there. It doesn't look tall enough to stand up in. This place is so much better than where we stayed in Surprise and Mesa. If we had to come back to Phoenix we would come back here. Space would probably be an issue during the winter, but since it's no longer high season, there are many free sites.